All Vocals, Ardanuy's solos, Cisão's bass, percussions, violin, acoustic guitars recorded , engineered and co-produced by Adriano Daga at LCM Studios in Brazil. Guitars recorded and engineered by Emppu Vuorinen at E-Major Studios in Finland. Bass Tero Kinnunen at O'hjaamo-Studio in Finland. Drums recorded and engineered by Casey Grillo at Above The C Studios in USA. © 2007 AFM Records GmbH. Recorded and Mixed by Brendan Duffey and Adriano Daga at Norcal Studios, São Paulo, Brazil. [P]+[C] 2008 AFM Records GmbH. 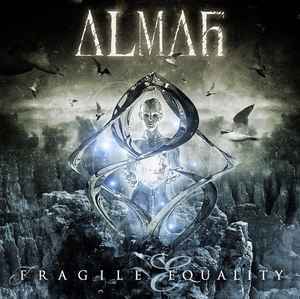 Bundle wrapping the 'Almah' digipak CD and the 'Fragile Equality' jewelcase CD together.